Preheat the oven at 375 F. Cook farro in 7 cups of previously salted boiling water, for 40 to 45 minutes. Note that its texture will remain chewy. Place the cubed squash on a baking sheet. Drizzle with 1 1/2 tablespoons of olive oil and 1/4 tsp sea salt and pepper. Bake in the oven turning once halfway through, for 20 minutes. Set aside. In a large frying pan, heat 2 tablespoons of olive oil. Add garlic stir for 15 seconds. Sauté the onion, mushrooms and asparagus until the asparagus is crisp and the onions and mushrooms are slightly browned. Set aside. In a medium frying pan, toast the walnuts on medium high until fragrant, about 3 minutes. Pour in the maple syrup and stir for 1 minute until the nuts are evenly coated. Transfer them to a piece of parchment paper. Coarsely chop the prunes. Place them in a medium bowl and add the lime juice and honey. Stir well and let rest for 8 minutes. Poke each shishito pepper with a fork and sauté them with a tablespoon of olive oil, in a medium frying pan until they blister a bit. About 3 minutes. Sprinkle Maldon salt on top and set aside. Drain the farro. Place it in a big bowl and pour in the balsamic vinegar, remaining olive oil, parsley and green onions. Stir the mixture well and evenly divide it into 4 bowls. 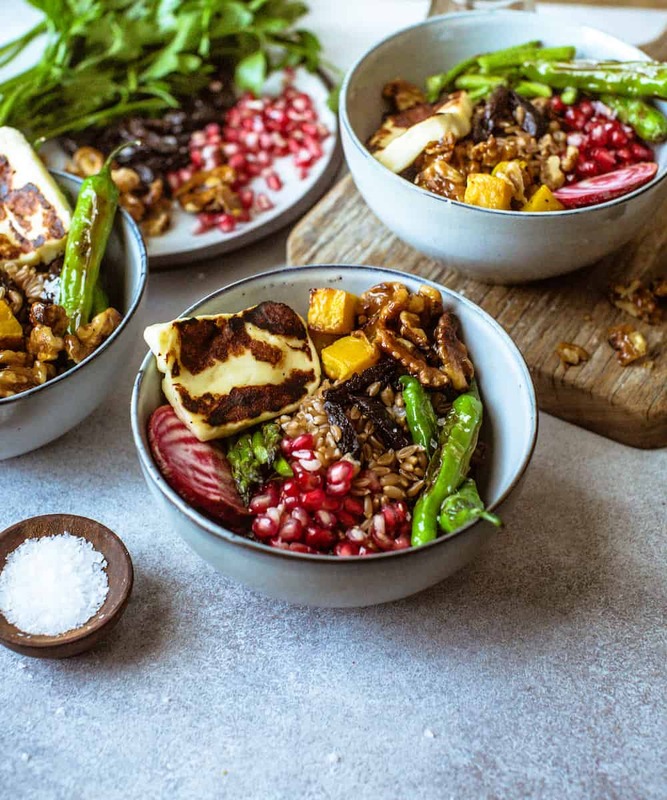 Top each bowl with the squash, candied walnuts, onion, mushroom and asparagus mix, pomegranate seeds and shishito peppers. Drain the prunes from the lime juice, and add a heaping tablespoon to each bowl. In the same frying pan used to sauté the peppers, pan fry the halloumi slices over medium heat. About 1 1/2 minute per side, or until golden. Top each bowl with one or two slices and enjoy!